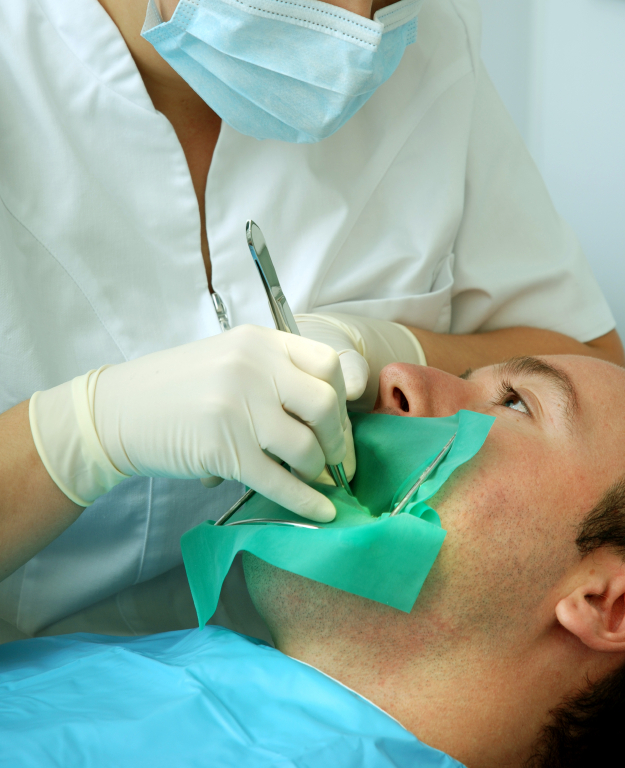 There are certain situations in dentistry, where we need to use what is known as a rubber dam. It’s actually similar to a ‘beaver dam‘ in that one of its purposes is to keep water away. It is a square piece of rubber (usually latex), which is secured to a tooth in the mouth with the help of a little metal ring called a ‘rubber dam clamp‘. Please see the accompanying photo. It doesn’t hurt and it makes the job of doing dentistry both easier for the dentist and the patient. When and why do we use it? 1) Root Canal Treatment: When we do a root canal, we need to use ‘pointy’ files to clean out the inside of the root. We want to make sure that if we drop one, the patient doesn’t aspirate it…so it is considered mandatory in this type of situation. (This may be a good time to check out the “root canal blog”). 2) To keep the area sterile: When doing a filling and especially a root canal, we have to make sure that there is no contamination from the bacteria in the saliva or soft tissues (oral cavity). 3) To isolate the tooth that we are working on: This will in turn improve visibility and access. The rubber dam keeps the cheek, lips and tongue away, which makes it easier for us to do our job. 4) To maintain a dry field: When we place a filling, especially a white one, we need to maintain a ‘dry field’ and have as little moisture as possible. Otherwise, contamination from the saliva, etc. can affect the bond between the filling and the tooth. I’m hoping that this entry helps people understand why we use something like the rubber dam…although it may seem quite ‘obtrusive’, it does serve a really important purpose and ensures a better quality end result!